Whether or not Donald Trump becomes the next President of the United States, he provides an ongoing problem for golf. For the second time in a month Martin Slumbers, the chief executive of the R&A, has been forced to deflect questions generated by the Republican front runner's election campaigning. Trump's outspoken plans to ban Muslims from entering the US and building a wall on the Mexican border are at odds with golf's ethos of becoming a more inclusive sport. The American billionaire owns Turnberry, the Ayrshire course that last staged the Open in 2009. Inevitably Slumbers is being quizzed over whether Trump is a suitable host for the world's oldest major championship. Last month, Slumbers, who in 2015 took over as chief of the St Andrews-based governing body, told BBC Sport that Turnberry is not being considered as an Open venue until 2022 at the earliest. He, therefore, reasons there is no need for any definitive statement at this stage. On Monday Slumbers held a media conference with the UK's golf correspondents and was peppered with more questions regarding Trump and Turnberry's future on the Open rota. Again he played the kind of straight bat that is currently so craved by the top order in English cricket. Slumbers would not be drawn on the subject. He is understandably more guarded than his predecessor Peter Dawson, who marked his departure from St Andrews last September by dismissing the notion that Turnberry's Open status could be affected. "To think that we are going to determine where an Open Championship is held because of something somebody said on the political trail in America is absurd," said the outgoing boss. "I don't think that's going to happen. We have other priorities, but that's for a future committee to judge." Dawson was right in the sense that it is for other people to decide, but it is becoming a difficult situation for his successor. At the moment Slumbers is playing for time because he knows to jump either way would be dangerous. If he took Dawson's line, the new chief executive would be open to criticism that golf's more politically correct outlook is a mere sham. Slumbers wants the game to be open to all yet would be giving a huge platform to a man prompting such outrage. Equally, if he said that the Open should have nothing to do with Trump, he would deprive the championship of one of its finest venues. How would Trump react to his resort being demoted from the top table of golfing venues? 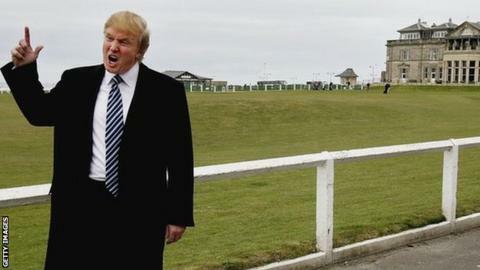 Would he continue to pour his millions into redeveloping Turnberry's famous hotel and golf course? It is fair to assume playing host to the Open was one of the attractions for Trump when he bought the place. And were he to pull out, what would that mean for the Ayrshire economy? Slumbers insists the current noise surrounding Trump is not problematic. "I wouldn't say it is making life difficult," he told BBC Sport. "I'm pretty clear about what I believe and I'm pretty clear about where we are going and we are pretty clear about where we are going to be until 2021. "So I think it is just part of the challenge of the responsibility we are trying to discharge." Slumbers confirmed that Turnberry does remain among the pool of courses considered suitable for staging the Open but he offered no guarantees over when the course might hold its next championship. The PGA Tour are wrestling with a similar dilemma regarding the WGC Cadillac Championship which will be staged at Trump's Doral Blue Monster course next week. They have indicated they will look for a new venue for the 2017 running of an event that traditionally attracts all the world's top players. "Mr Trump's comments are inconsistent with our strong commitment to an inclusive and welcoming environment in the game of golf," the Tour said in a recent statement to Golf.com. "Immediately after the completion of the 2016 tournament, we will explore all options regarding the event's future." PGA Tour Commissioner Tim Finchem can expect a similar grilling to the ones endured by Slumbers if he talks to reporters at the south Florida venue next week. There are no easy answers, especially when you consider Trump's current prominent position in the US polls. And regardless of whether he goes on to become the next President of the United States, he will remain the owner of several very significant golfing venues. Assuming his controversial views remain similarly intact, golf will have some difficult choices to make. Right now the game's bosses are understandably stalling but there will come a time when that will not be enough. Read more on Bryson DeChambeau: Is this student golf's newest trendsetter?